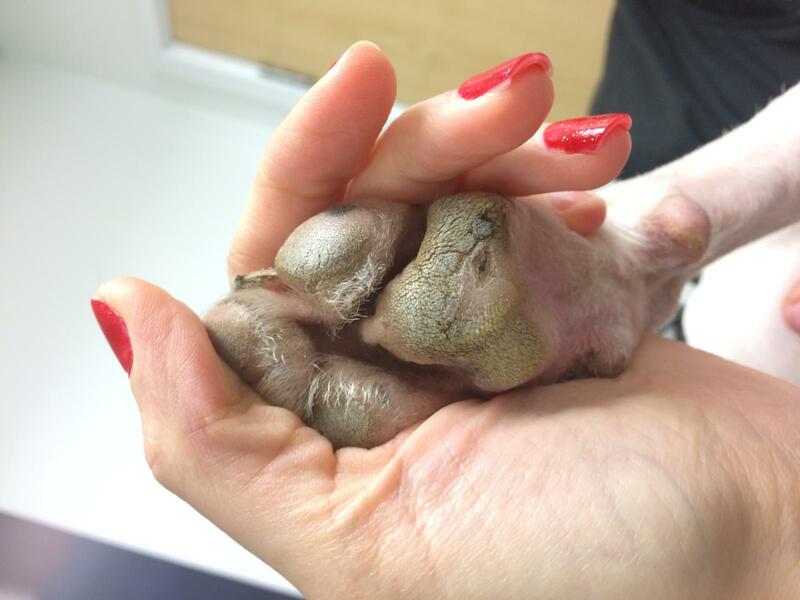 Bruno cut his metacarpal pad, which is the main pad, on his left front paw whilst out walking. 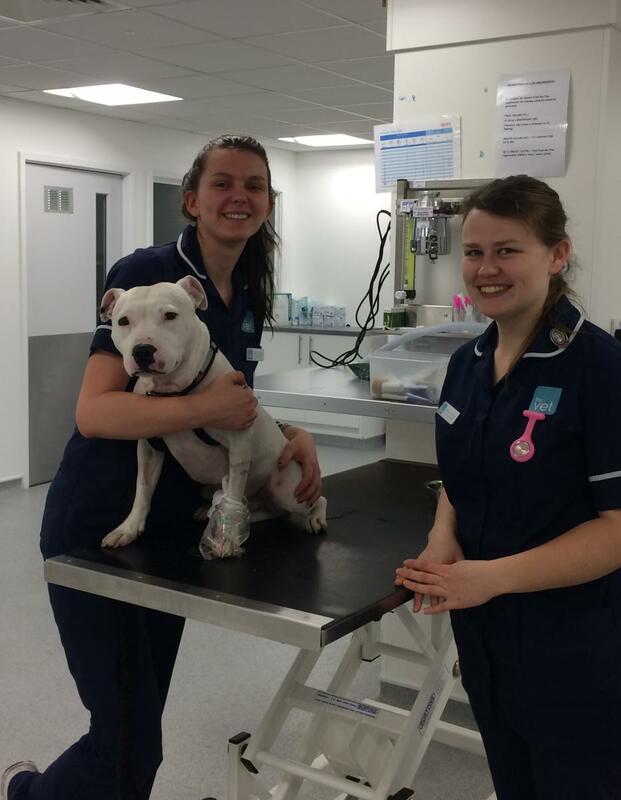 His owner brought him in to The Vet Nottingham for this to be checked by a vet. When they saw Bruno the cut to the pad was quite deep and was bleeding. Although Bruno wasn’t limping on this leg it was important that they cleaned the wound and bandaged the foot to stop any dirt or bacteria from getting into the wound preventing it from healing and becoming infected. At the same time they applied Manuka honey to the wound. Manuka honey is a very effective wound dressing as it helps with the healing process by several different means. Honey has a broad spectrum antibacterial activity which helps to resolve any infection. It is also an acid which helps to release oxygen from the haemoglobin in the blood cells and prevents destruction of the tissue. Since it contains so much sugar, honey has a high osmolarity which means it draws fluid out of the wound. This allows lymph, which is a fluid that contains white blood cells, destroy bacteria and remove dead tissue to access the wound. Two days later they saw Bruno again to change the bandage and check the wound for infection and to decide whether it was possible to stitch it. When they removed the bandage there was a flap of devitalised tissue which had lost its blood supply. This meant that they needed Bruno to come in the next day for sedation to debride the wound removing all of this dead tissue. Unfortunately this also meant that they would not be able to suture the wound together because there would be too much tension across it causing it to breakdown. When Bruno came in the next day they gave him an injection of sedation and some anaesthetic gas. This allowed them to have a good look at the wound, clean it with some iodine and to cut away the dead tissue. Once all of the wound edges were bleeding they knew that they had removed enough of the dead tissue and the blood supply to the area would help the wound to heal.They then applied some more honey to the wound and another bandage. Unfortunately, when it is not possible to stitch the edges of a wound together it takes much longer for it to heal and they call it healing by ‘second intention’. Granulation tissue has to form in the wound which contains lots of new blood cells. After this new skin cells grow across the wound from the edges and the wound contracts until it is completely healed over. Since this type of healing can take a few weeks Bruno had to keep coming back to have his bandage changed every few days until the wound closed over. It has healed well and Bruno can go for long walks in the park again.